What surprised me the most about the NASA Space Apps Challenge was why it took so long to have one held in Hawaii. This was the fifth annual challenge held internationally, but the first one here. According to the Open NASA website, “The International Space Apps Challenge is NASA’s incubator innovation program to spur innovation by convening global citizens around NASA’s open data to solve mission-relevant challenges.” With our general interest in STEM (science, technology, engineering, math), this event sounds like a natural. Without a second thought, I had to be a part of this event. This was the first opportunity for me, as an open-data wonk, to hack some science data with a team of citizen coders, science enthusiasts and subject matter experts. Most of the time, I work on open-government data in a category I call civic tech. But more about our #SpaceApps project entry later. 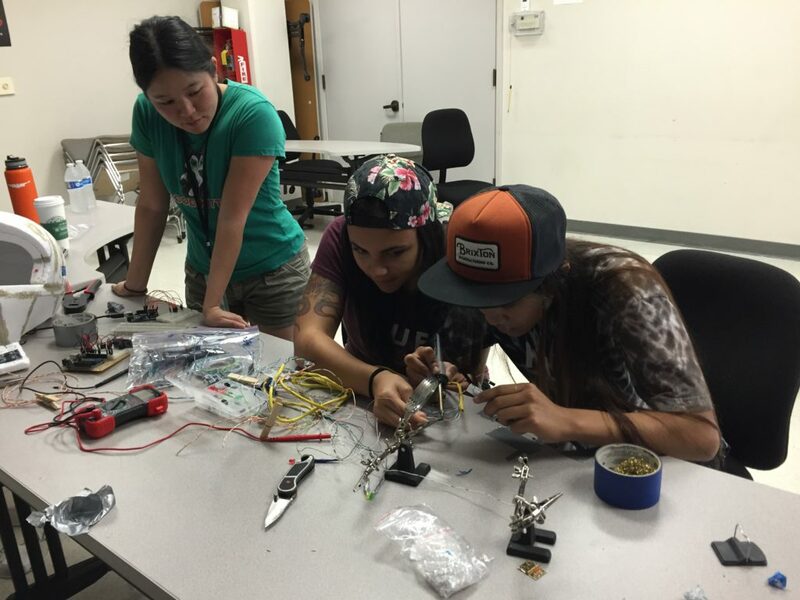 Kelli Borgonia, Te Vallee and Jen Fernandez work on the electronics for their heads-up display at the NASA Space Apps Challenge 2016, held for the first time in in Honolulu. The event was organized by DevLeague, an intense training bootcamp for coders and programmers based here in Hawaii. Co-founder Jason Sewell told me one of his students who is interested in space applications approached him with the idea of hosting the NASA Space Apps Challenge. That DevLeague student was Laura Gonzalez. She was attracted to this challenge because participants aren’t limited to working on coding projects; anyone could join and create something, whether that meant designing a space suit, planning out rocket specs, or creating a virtual reality game. Another aspect that attracted her was that this challenge was open to people of any age. All you needed to have was an interest in space. Kelli Borgonia, from Team Space HUD (heads-up display), models a handcrafted proximity sensor helmet. According to the organizers, there were 100 attendees at the kick off event on Friday evening. At these weekend hackathon events, the first night is for project pitches and team formation. The process is pretty organic. Some pitches are done on the spur of the moment, others have an idea and team in mind. NASA provided a wealth of information on their websites, OpenNASA and Data.NASA.Gov. There, you can find data, coding and application programming interfaces on subjects such as climate data, near earth objects, the solar system, living on the space station, rocketry and everything in between. The six challenge areas for 2016 included: technology, aeronautics, the space station, the solar system, Earth and the journey to Mars. Saturday and Sunday were spent with the teams, heads-down developing each idea into a prototype. I spent time on team Coral Beat, but I did survey the field to come back with this report. In all, ten teams presented their projects on Sunday afternoon. We All Track Earth’s Rising Sea Levels or W.A.T.E.R.S. demonstrated what sea level rise looks like at various locations around Oahu. Laura Gonzalez, whose initiative made the apps challenge a reality, lead the presentation, which animated the rising sea over a number of years. The website W.A.T.E.R.S. won the award for Best Execution. With Air Check app, searching for a major U.S. city would return air quality data. It also had a crowdsourced feature that showed aggregated data on the condition of people who opted into the app. Conditions like sore throat, sneezing, coughing and watery eyes were displayed in a colorful bar chart. This team won an Honorable Mention. The team I participated in was called Coral Beat. We were interested in sea surface warming, and how this warming impacts reefs and could lead to coral bleaching. We were able to get satellite data from NASA and additional data from the National Oceanic and Atmospheric Administration and the Hawaii Institute of Marine Biology. With photos and video we built an interactive map that allows the viewer to explore actual footage. Our site CoralBeat.org won the award for Best Overall project. 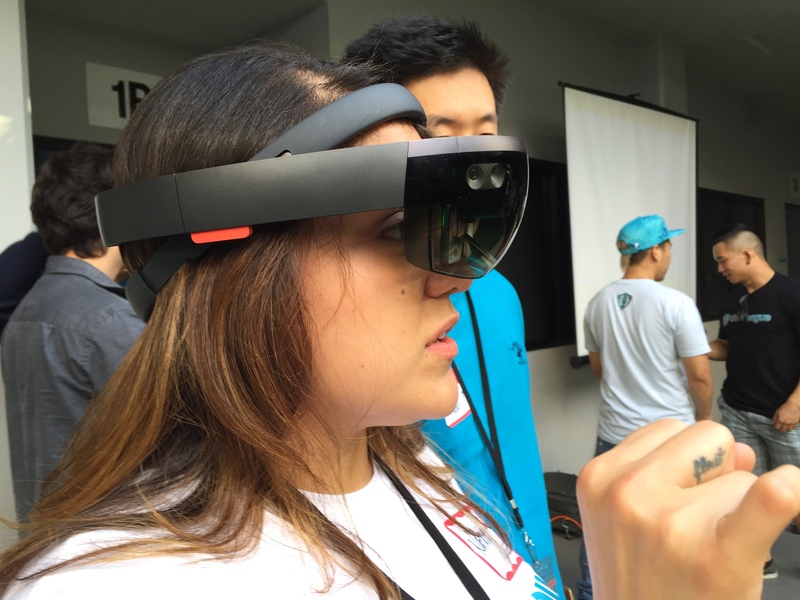 Natalie Ramirez, a DevLeague student, looks through a Microsoft Hololens at the NASA Space Apps Challenge, in Honolulu. 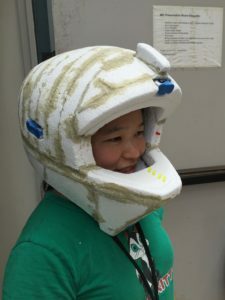 Koala Space Program was a survival colonization simulation staged on Mars, built by a team of computer science majors at the University of Hawaii. They gamified what appeared like a Sim City program set on Mars. Their entry won for Most Creative. In the short turnaround of five weeks, the first NASA Space Apps Challenge was completed. Sewell and the team at DevLeague are looking to next year to roll this out on a larger scale. The grander vision is to work 6-8 months ahead of the event and get the institutions that conduct space research to be part of the planning.